Gary Ryan - Beyond Being Good: What is your service-quality gap? It is one thing to be able to understand the expectations of those you serve. A gap can emerge if your translation of those expectations into service standards is inaccurate. Service standards are effectively the systems and processes that you put into place to ensure that you can consistently meet the expectations of your customers. This is very easy to get wrong and requires a high understanding of the expectations of your customers, as well as a high level of understanding of how your organisations works if you are to minimise this gap. 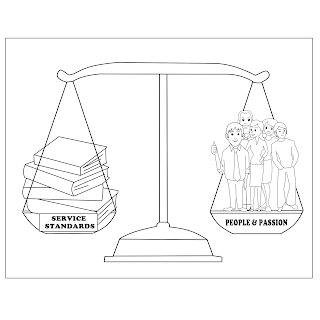 Hiring the right people with the passion to serve, and supporting them with appropriate service standards is critical for minimising this gap. The members said that they wanted the gymnasium to open at 6am. So I employed the staff to start their shift at 6am. The members were still not happy. I was confused. When I asked them again why they weren’t happy they said, “We told you that we wanted the gym open at 6am, not ‘opening’ at 6am. There’s a difference!” Finally I understood. The staff would be paid to start at 5:45am so that the gym would be truly open as had been requested. I had been wrong. I had misinterpreted the expectations of the members. How large is your Management Perception Gap?